An impressive range of 30 international luxury watch brands will be on hand to welcome horological enthusiasts, connoisseurs, and collectors to the fourth edition of WatchTime New York on October 26 and 27, 2018. The two-day event, held in the beautiful ambience of Manhattan’s Gotham Hall, prominently located in the heart of Midtown Manhattan, offers plenty of opportunity for enthusiasts and the curious alike to get in contact with brands and try on their watches. Among the distinguished names slated to bring their latest timepieces and U.S. debuts are highly prestigious Swiss manufactures like Jaeger-LeCoultre, Breguet, Omega, and Vacheron Constantin to name just a few. Noteworthy are intriguing indie brands like MB&F, the USA’s own RGM, Czapek & Cie., and the superb Fiona Krüger. All of them will show off their latest innovations and cutting-edge designs. Here are five personal highlights from the sophisticated horological pieces on display: a deeply classical timepiece, a stunningly skeletonized masterpiece, a highly successful remake, a notably contemporary wristwatch, and a precision-tested pilot’s watch. The only full-blown watch manufacture of the United States, RGM is based in Lancaster County, Pennsylvania. Founded in 1992 by Roland G. Murphy, the company has made a name for itself by manufacturing its own high-end calibers, some with complications, and employing traditional craft techniques like in-house engine-turning for the dials. 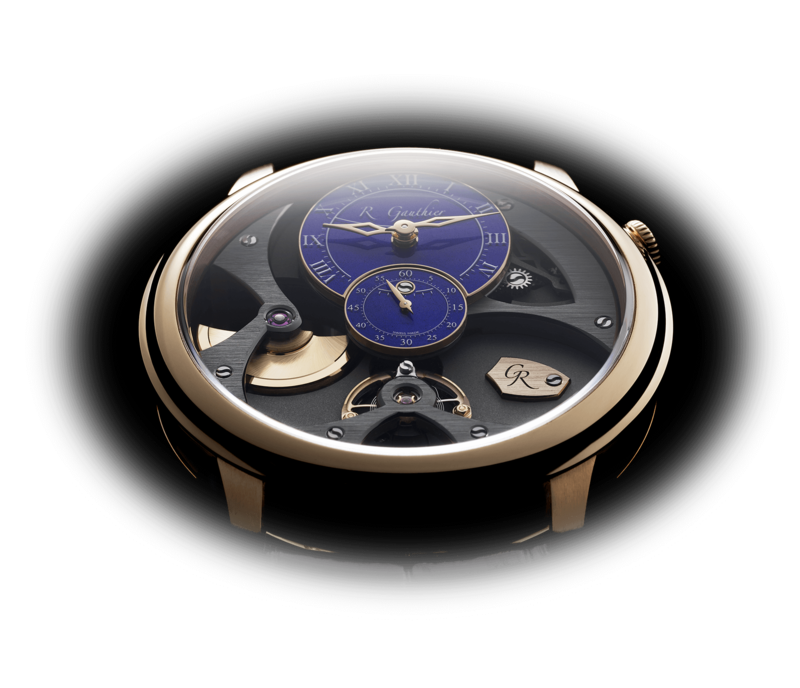 The company’s philosophy also characterizes RGM’s timepieces with stories to tell. Folks from Pennsylvania and history nerds will instantly recognize the historic personality behind this particular watch: William Penn, the founder of Pennsylvania, who helped establish many fundamental liberties through his written constitution. Whereas the first examples of the William Penn series introduced about 18 years ago featured either a subsidiary seconds dial, a date display, or a moon phase indication, the latest edition on display at WatchTime New York “only” includes the line’s typical moon phase in addition to the unusual power reserve indication. Apart from that, every inch of the latest reissue is a true William Penn. Available in pink gold or stainless steel, this watch is housed within the line’s signature tonneau-shaped case and refined rectangular dial featuring two different hand-cut guilloche patterns, one in the center and the other on the power reserve indication located at 1 o’clock, which is quite an uncommon, but expressive, position. The beautifully detailed moon phase indication at 6 o’clock includes a smiling man in the moon surrounded by a night sky and golden stars. To complete this elegant aura, the timepiece boasts blued steel hands and bold Roman numerals that contrast well with the solid silver background. In keeping with the historical nature of this timepiece and the new-old stock movement, it is not powered by one of the brand’s newer manufacture movements, but instead by a modified Jaquet 736 (now La Joux-Perret) with manual winding. The exhibition case back reveals the Swiss movement’s intricate finishing including Geneva stripes, perlage, and blued screws. For more information, please visit www.rgmwatches.com. This year has proved a great one for skeleton watches (see Five Skeleton Watches: Omega, Jaquet Droz, Audemars Piguet, Chopard And Arnold & Son Become Transparent), with many new examples puffing a fresh breeze into the ancient craft. Among them was a true surprise marking a first for Jaquet Droz’s Grande Seconde collection: the Grande Seconde Skelet-One, the “one” in the name of this new timepiece underscoring its unique character. The timepiece is available in red gold, white gold, and black ceramic. According to the traditional Swiss manufacture looking back on 280 years of history in 2018, the goal was to “let the light shine to the deepest reaches” of this sophisticated timepiece, all while preserving the figure 8 shape that is its hallmark. The dial, distinguished by the signature hour-and-minute counter with Roman numerals at 12 o’clock, is dominated by a large subdial for seconds made of sapphire crystal with Arabic numerals that allows a front-row seat view into the painstakingly skeletonized movement. The base plate is entirely open-worked as is the oscillating weight in gold. The Grande Seconde Skelet-One is powered by Caliber 2663 SQ, which is equipped with a double spring barrel and a silicon balance spring and pallet fork. For more information, please visit Jaquet Droz Grande Seconde Skelet-One: One Of These Things Is Not Like The Others and/or www.jaquet-droz.com. While these days mechanical wristwatches with an alarm function are quite rare, they once represented cutting-edge technology and the latest in watchmaking. One of the most iconic of all these is Jaeger-LeCoultre’s Memovox, which made its debut in the early 1950s. Its alarm function proved very handy in the booming business era of the time and soon became a standard for many businessmen, reminding them discreetly of meetings. The Memovox was quite successful through the following decades: a gorgeous example springs to mind with world-time indication and the really cool Memovox Parking function, which informed its wearer when his or her parking meter would run out of time. Fans of the brand also might remember the Memovox Deep Sea, a superb diving watch whose automatic Caliber 815 could produce an audible alarm sound underwater. It was however 1965’s Memovox Polaris diver that served as a source of inspiration for the new Jaeger-LeCoultre Polaris line introduced at SIHH 2018. In that era of space and deep-sea exploration, Jaeger-LeCoultre saw the need to improve its striking mechanism in order to ring even more loudly underwater. One problem was the muffled chime when the watch came in contact with a diver’s wetsuit, so a clever triple case back construction became the order of the day. In 1968, the brand designed a new, sportier dial for this watch. Its pad-printed numerals were coated with tritium, as were the hour makers redesigned in a trapezoid shape, with the small triangle indicating the alarm time. The baton-shaped hands were also covered with luminescent material. Much to the delight of many enthusiasts, the “Grande Maison” launched a new collection based on this very model in 2018. Unlike the original, the new version boasts an inner sealed case back that functions as a resonance chamber. This is made possible thanks to the fact that the gong is now positioned differently within the movement (toward the back) and that there is an outer case back with 16 openings to allow the sound to escape. It goes without saying that this new diver-inspired icon is equipped with Jaeger-LeCoultre’s latest technical innovations: Caliber 956’s rotor is embedded on ceramic ball bearings that don’t require lubrication. This black dial represents authentic vintage style at its best! It features a curved inner rotating bezel for timing dives, bold applied Arabic numerals and trapezoidal hour markers, and a sunburst-finished center circle for the alarm complication. In accordance with the signature aesthetic of the original, the hour and minute hands are executed in baton style. For more information, please visit 6 New Watches In Jaeger-LeCoultre 2018 Polaris Collection Including A New Memovox Model and/or www.jaeger-lecoultre.com. Following the success of Zenith’s trailblazing Defy Lab concept watch, which employs a super-high-frequency monolithic silicon oscillator, and the high-beat Defy El Primero 21 chronograph (frequency of 50 Hz allowing for the measurement of 1/100th of a second) in 2017, this year the Le Locle-based brand added an entry level to the modern range in the form of the Defy Classic: a three-hand timepiece with date indication at 3 o’clock. Two options with all kinds of straps and bracelets are available. One features a handsome skeletonized dial that reveals the date mechanism. However, my personal favorite is the other one with a very clean sunray-brushed blue dial, best paired with a leather strap to make for a perfect dress watch while still offering some sporty elements like water resistance of 100 meters and an ultra-light titanium case. I feel that the Defy Classic was one of the most handsome debuts of 2018, a picture-perfect example of what a modern Swiss luxury watch should offer: understated dial design with a focus on readability, a well-proportioned case, an elegant feel, robustness, and – of course – a good mechanical movement. And this design honors the watchmaker by making Zenith’s Elite Caliber 670 visible through the sapphire crystal in the case back. Where we can also plainly see the brand’s star logo making its revolutions on the rotor. In a thorough compilation of watches, one genre of modern wristwatch should not go missing: the pilot’s watch. Ever since humankind has dared to conquer the skies, wristwatches have stood the test of time by proving their worth in daring aviation adventures. Although pilots have no more need for them today as navigation systems have taken over the task, these wristwatches remain highly sought after by enthusiasts. No surprise there: pilot’s watches retain the aura of a genuine instrument one can rely on in any situation. Plus, they boast their very own distinctive style. It is actually quite amazing how their basic uniform characteristics – a dark dial with perfect readability and luminosity, a sturdy case, proven precision, and optional resistance to magnetism – have inspired watchmakers to create a plethora of variations for more than a century. A more recent example of great pilot’s watches is the British marque Bremont, founded in 2002 by brothers Nick and Giles English, who had survived a crash with their vintage airplane. This personal history explains the company’s particular strive for tough tool watches with the best precision possible. This quest is underscored by official C.O.S.C. chronometer certificates and real-life testing by specialist flying squadrons and British ejection-seat manufacturer Martin-Baker. The same strict requirements ring true for these watches’ habillage: the stainless steel cases are treated for hardness and scratch resistance with a special technology making them seven times harder than regular stainless steel. The stealthy U-2/51-JET offers a new twist on the brand’s existing range, taking design cues from some of Bremont’s military pieces commissioned by the Royal Air Force’s 100 squadron members to complement their Hawk T1 jet aircraft. It combines the brand’s trademark vintage 51 lume, originally found on the P-51 limited edition, with tempered blue steel hands that contrast very well with the dark backdrop of the instrument-style dial with a decidedly cool vintage touch. The case treated with Diamond-Like Coating features the brand’s signature three-part construction with the inner bidirectional bezel operated by the second crown at 4 o’clock. Water resistant to 100 meters, it is powered by a C.O.S.C.-certified automatic movement visible behind a smoky transparent case back. This rough-and-tumble watch just made its movie debut on actor Tom Hardy’s wrist in the action-packed movie Venom, which has been in theaters since early October 2018. For more information, please visit www.bremont.com. Great article. However, you swapped the JLC and Zenith thicknesses, and the Zenith is 41 mm. Thanks for pointing that out – got ’em corrected now!